I get bored with wearing suits the traditional way, don't you? Don't get me wrong, a tie and pocket square are often my dapper go-to's when in a blazer, but it's fun to mix it up a bit. A tee and sneakers give you a casual, downtown vibe while still meeting the jacket requirement. It's not a look for everyone but like with all fashion, just wear it with confidence and you'll be good to go. 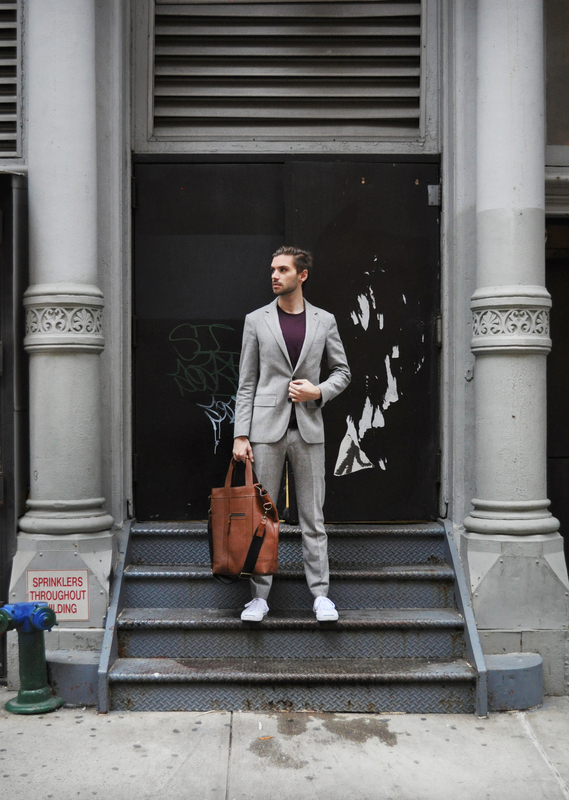 Oh and p.s., the menswear color I'm obsessing over right now: burgundy. It comes around every year in various forms (last year it was oxblood), but it's one of those rich color profiles that just feels warm, cozy and masculine. It prepares you for the Winter ahead. I'm not saying run out to buy a burgundy trench.. but a tee, pant or scarf here and there might be the hit of color your outfit needs this season.